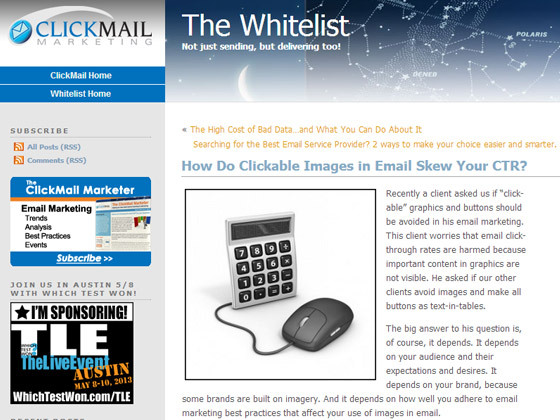 ClickMail – How Do Clickable Images in Email Skew Your CTR? Recently a client asked us if “click-able” graphics and buttons should be avoided in his email marketing. This client worries that email click-through rates are harmed because important content in graphics are not visible. He asked if our other clients avoid images and make all buttons as text-in-tables. The big answer to his question is, of course, it depends. It depends on your audience and their expectations and desires. It depends on your brand, because some brands are built on imagery. And it depends on how well you adhere to email marketing best practices that affect your use of images in email. Make no mistake: we people are visual creatures. Imagery has its place, and it’s a pretty high priority one. (If you think images don’t matter, please explain the escalating popularity of Pinterest!) In most cases, an email is more visually appealing when it includes an image, and that could mean higher conversion rates. However, in most cases, the image won’t be seen due to image blocking. Let’s also be clear that we aren’t only talking about pictures. The term “images” also refers to graphics like call to action buttons or call-outs with the offer highlighted, such as a graphic that says “35% Off” or “Only 3 Days Left.” When images are blocked, not only does your recipient miss out on the possibly engaging pretty picture. He or she will miss out on the offer or deadline too, if you’re not working around the whole image blocking issue. And you’ll miss out on the opportunity for conversion. Lest we get too far into this discussion under false pretenses, let’s make sure this is clear from the start: images are blocked by default in most email clients, meaning many times images aren’t seen anyway, whether a picture or a graphic. If it’s an image, it’s blocked until the recipient says otherwise. And don’t assume they will say otherwise. In one study of consumer behavior, only 55% of respondents said they turn on the images in the emails they receive. But only 16% will add a business as a safe sender—which would ensure images appear inevery email from that sender. That puts the onus on the marketer to make sure recipients want to see the images in your emails and will choose “show images” consistently (although you should continue to ask to be added to the safe senders list too). We saw this post and thought we would share it with you. 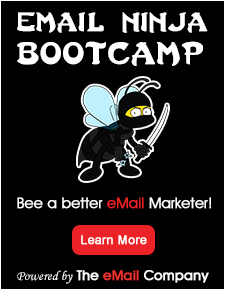 Want to check out the who’s who and what’s what of email marketing?